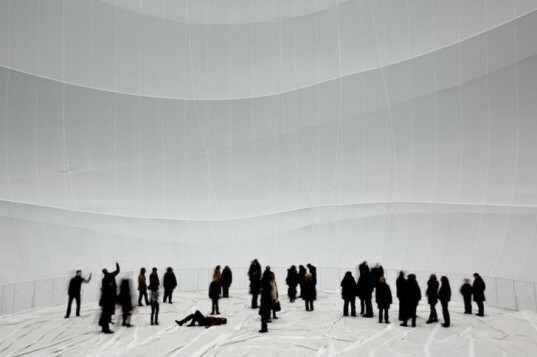 Christo's latest large-scale installation, Big Air Package, is now on view inside the historic Gasometer in Oberhausen, Germany. The giant inflatable sculpture, which measures 90-meters high and 50-meters-wide, is the largest indoor sculpture ever made. Built using 20,350 square meters (219,000 square feet) of semitransparent polyester fabric and 4,500 meters (14,800 feet) of polypropylene rope, the sculpture fills the inside of the former industrial gas tank. Lit from above via skylights in the Gasometer, Big Air Package is described as a "cathedral of air", filled with diffuse natural daylight and muffled sounds to create a place of tranquility. Big Air Package is Christo’s latest installation, designed and completed entirely after his wife, Jeanne-Claude passed in 2009. It is the largest of the Package projects and considered the largest indoor sculpture in ever created with a total volume of 177,000 cubic meters (6,250,000 cubic feet) and a total weight of 5,300 kilograms (11,700 pounds). The white inflated sculpture occupies almost the entire gas tank, which is one of the largest tank of its kind in the world as well. The Gasometer Oberhausen was originally built in the late 1920’s to store the blast furnace gas, but has been decommissioned and used as a large-scale exhibition space since 1994. Christo, who is considered to be an environmental artist and draws attention to the land, nature and man-made objects through his installations, is now drawing attention to this historic industrial artifact. Like the gas that at one time filled the space, Big Air Package occupies the area, but this time with light and air. Visitors to the exhibit enter through an air lock and can enjoy the peace and relative silence inside the space. Two air fans create a constant pressure of 27 pascal (0.27 millibar) to keep the sculpture inflated. Big Air Package opened to the public on March 16th and will be open through December of 2013. It is unclear at this time what will be done with the thousands of square meters of fabric at the end of the installation. Christo’s work is often recycled at the end and we can only hope this fabric has a higher purpose then as well. Christo's latest large-scale installation, Big Air Package, is now on view inside the historic Gasometer in Oberhausen, Germany. The giant inflatable sculpture, which measures 90-meters high and 50-meters-wide, is the largest indoor sculpture ever made. Big Air Package is Christo's latest installation, designed and completed entirely after his wife, Jeanne-Claude passed in 2009. It is the largest of the Package projects and considered the largest indoor sculpture in ever created with a total volume of 177,000 cubic meters (6,250,000 cubic feet) and a total weight of 5,300 kilograms (11,700 pounds). 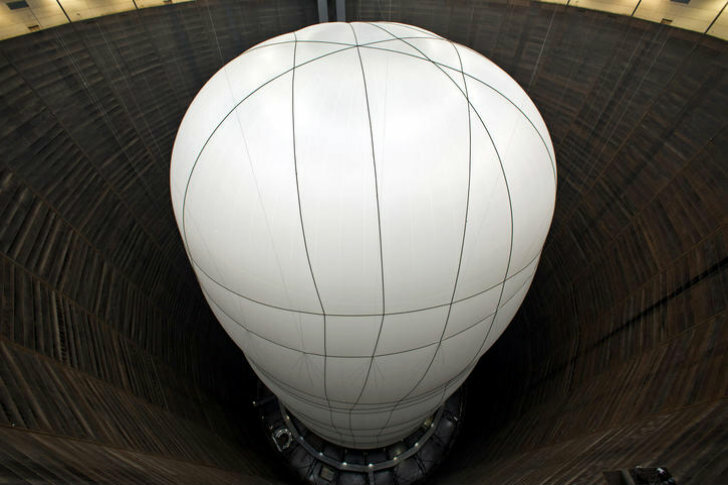 The white inflated sculpture occupies almost the entire gas tank, which is one of the largest tank of its kind in the world as well. The Gasometer Oberhausen was originally built in the late 1920's to store the blast furnace gas, but has been decommissioned and used as a large-scale exhibition space since 1994. Christo, who is considered to be an environmental artist and draws attention to the land, nature and man-made objects through his installations, is now drawing attention to this historic industrial artifact. Like the gas that at one time filled the space, Big Air Package occupies the area, but this time with light and air. Visitors to the exhibit enter through an air lock and can enjoy the peace and relative silence inside the space. Two air fans create a constant pressure of 27 pascal (0.27 millibar) to keep the sculpture inflated. Big Air Package opened to the public on March 16th and will be open through December of 2013. It is unclear at this time what will be done with the thousands of square meters of fabric at the end of the installation. Christo's work is often recycled at the end and we can only hope this fabric has a higher purpose then as well. Raising of the fabric and inflation of the sculpture. A seamstress completes work on the fabric shell. A drawing of Big Air Package.